The Ester Embossable polyester film Type EM is a biaxially oriented polyester film with the coextruded surface layer making it suitable for direct embossing in the holographic industry. This direct embossing property of the film eliminates the requirements of off-line coating, thereby reducing the process cost substantially. This type of direct embossing is also known as soft embossing. Holographic embossed films (dominant application) or HEF's are used mainly to establish a product image, give aesthetic appeal. In addition, these holographic patterns overprinted with brand graphics, enhance the visual appeal significantly vis-à-vis the familiar traditional packaging. The film is also widely used for security stickers as a deterrent for duplication and counterfeiting of products. 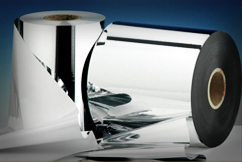 The Ester Embossable Film is available from 13 to 52 micron. The thicker variants are used to provide a three dimensional lens effect which is used for packaging premium products like perfumes etc. As a result, more and more brand managers are adopting the use of HEFs in flexible packaging.